Washington, NJ: Vibrating fluid bed dryers from process equipment manufacturer The Witte Co., Washington, New Jersey (www.witte.com), feature multiple temperature control zones that operate independently to permit a variety of different heating and cooling levels in the same continuous drying system. 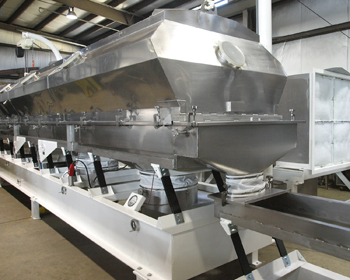 Ideal for gently drying snack chips, grains, cereals, pharmaceutical powders and other sensitive or delicate products, the Witte fluid bed dryers allow substantial moisture removal to occur at a relatively high temperature in the first heating zone while gradually lower temperatures in each successive heating zone achieve the final desired moisture content. Product degradation including charring and discoloration is reduced, the particle structure remains intact and product waste is virtually eliminated. A proprietary Witte design, the fluid bed dryers with independent temperature control zones create more drying capacity in pounds per hour per square foot of dryer deck than ordinary dryers that restrict moisture removal to a single temperature throughout the process. The increased drying efficiency also allows many high volume processes to meet moisture specifications using a more compact dryer on a smaller footprint.